Posted May 7th, 2015 by Mobile Music School & filed under Announcements, Music Lessons. 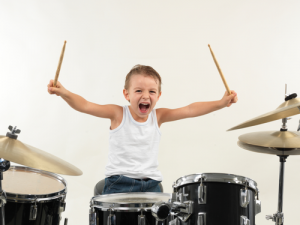 Here at The Mobile Music School, the aim of our workshops is to give each student or participant a complete immersion into a particular area of music whether it be drumming, singing or musical theatre. Each of our workshops is structured to accommodate beginners, students with some musical knowledge, as well as complete experts. No matter what your ability may be, The Mobile Music School has something for you! Our main goal is to ensure that the process of making, learning and exploring music is made simple, as well as enjoyable and educational for everyone involved. Staffed by qualified, dedicated and experienced professionals, we’ve built our reputation on a commitment to excellence through fun-based learning. Workshops are planned to be stand-alone sessions. They culminate in an end-of-workshop ‘class performance’, which consists of a set performance piece learnt during the class. We find that through this approach, the participants leave each workshop with a sense of achievement. Not only is their musical awareness increased, their confidence and self-esteem is also boosted as they’re encouraged to perform at a level they’re comfortable with. The workshops currently on offer here at The Mobile Music School are ‘Let’s Drum’, ‘Let’s Sing’, ‘A Musical Slice’ and ‘Learn & Explore’. Each workshop is planned accordingly for the particular class group whether it’s in primary school, secondary school or any other educational institution.